A quick dry ready to use, water based treatment. Removes and neutralises rust, leaving a lasting seal which prevents future rusting. Can be overpainted without the need for a primer. Approx coverage: 6-8m2 per litre. 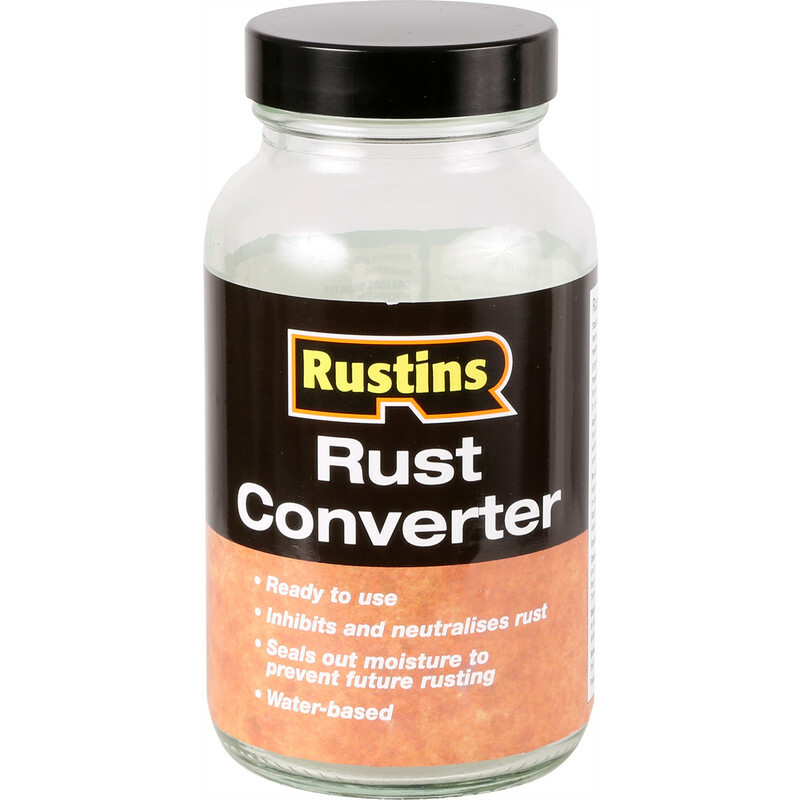 Rustins Rust Converter 250ml Clear is rated 4.4 out of 5 by 8. Rated 4 out of 5 by SP37 from Seems like product works Seems like the product works. I applied to steel (Narrowboat) and the surface colour changed colour. It seems to be a trust worthy product. And seems to go a long way. Well worth using for piece of mind. Rated 5 out of 5 by Monman from Works very well Does a good job sorting rust, just be careful and wipe the jar before replacing the lid , I had to break it to get it off the next time I used it. Rated 5 out of 5 by Tony647 from Works well. Ordered, collected within 1 hour. Staff were excellent, efficient and pleasent. I was doubtful about this stuff, does it really work ? Answer, Yes It does ! Rated 5 out of 5 by pastit from works well does all that it says on the jar. very pleased with it. Rated 5 out of 5 by denc from works well good performance always keep a bottle on shelf. As good as any other rust treatment and easy to use.